Customise the look and feel of your Planet eStream Video Platform to echo your branding, ensuring that it fits comfortably within your eLearning ecosystem. Change colours and layout, add your own images and logos, translate to your chosen language on a global, group or individual user basis and even incorporate your own CSS coding. Create a user interface and experience unique to your organisation or department. Create the most engaging user experience by building specific homepage designs and layouts for different user groups. This personalises the look and feel on a departmental/faculty/special interest group basis and enables you to push relevant content to your users. See how easy it is to customise the look and feel of your Planet eStream platform by watching this short video. 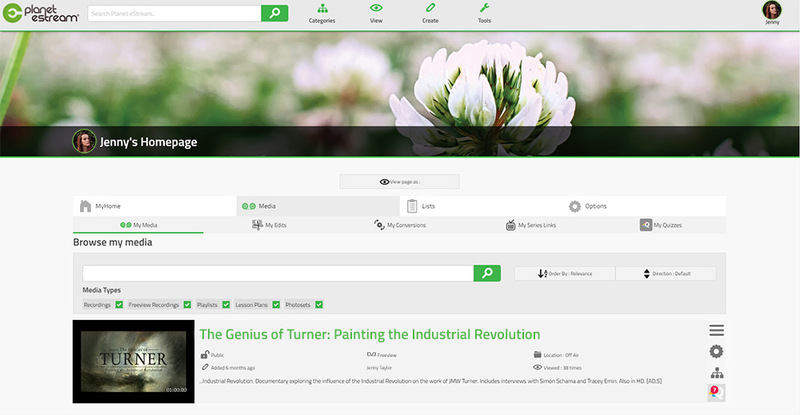 Widgets can be added to page layouts and embedded in other learning platforms. They take the form of carousels, sliders and grids and the content they display is defined by their creator. Widgets can be used to push curriculum/course relevant content to students either within your Planet eStream media archive or embedded in your VLE. These are also great for showing recently added content for subject categories, user groups or departments. Introduce a social aspect and enable your users to design their own custom ‘My Home’ page with avatar and banner images. Here they can access their favourite content plus media feeds from courses and users they are subscribed to. Create your own category structure with an unlimited number of subcategories and subcategories of subcategories etc. Categories can be customised with their own name, custom icons, banner images and layouts and are perfect for organising and syndicating uploaded material. Typically, organisations will build a category structure that maps core curriculum subjects, college courses or university faculties, it is also common to see global categories containing whole organisation general interest content such as sporting events, productions etc. When setting up Planet eStream you can also specify your own metadata fields, these can take the form of radio buttons, check boxes, drop down menus, and free text items. Metadata fields are a great way of tagging content and can be used to syndicate your media and automatically populate categories, reducing administration. Cascading Style Sheets (CSS) is a mark-up language that controls the appearance of HTML elements on a web page. CSS allows designers to easily create a completely unique user interface with almost endless possibilities. Using the Planet eStream administration console, administrators can easily translate the user interface automatically on the fly with the option to manually overwrite words and phrases as required. The translation can be applied on a global, or user level to provide maximum flexibility with your user experience.